Ella Bianco (17) heads in a corner kick from teammate Kaileigh Nuessgen in the first half of Beavercreek’s 4-2 state championship win in Division I girls soccer, Friday, Nov. 9 at MAPFRE Stadium in Columbus. Diana Benigno finds herself double teamed by a pair of Strongsville Mustang defenders, during Friday’s Division I girls high school state championship match at MAPFRE Stadium in Columbus. COLUMBUS — Too much pressure and too much talent. That’s what Beavercreek had in the Nov. 9 Division I girls high school soccer championship 4-2 win over Strongsville, at MAPFRE Stadium. Then the Beavers had to withstand a solid Strongsville comeback in the second half, to clinch the win. 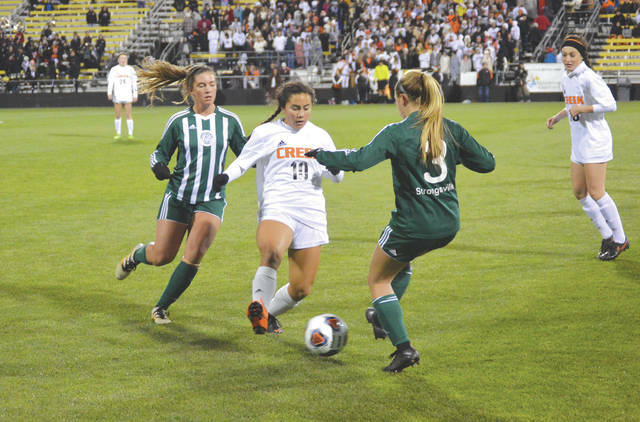 According to OHSAA’s Jerry Snodgrass, Beavercreek was the just the third team to win a Division I title by going undefeated, and they scored Ohio’s second-most goals (140) in a season. Beavercreek outshot Strongsville by a 7-6 margin in the opening 40 minutes of play, but they made four of those seven shots count, to grab a 4-0 lead. With 13:16 gone in the opening half, Marcella Cash broke free from just outside the box to drill a shot into upper left of the Strongsville goal for a 1-0 Beavercreek lead. Cash was able to reflect on her team’s championship season, as she made her way to the locker room. “This means everything to me. We worked so hard all year to get here, and everyone I felt in the past, they never felt that we’d be able to do it, and we did it the best we could. Twenty four and 0, and everyone worked so hard to get this. We’re all so happy,” she said. 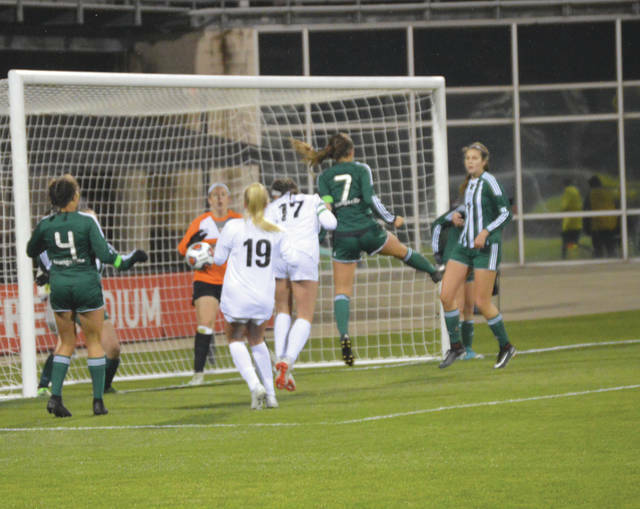 Ella Bianco then capitalized off a free kick from about 30-35 yards away, scoring an unassisted goal into the left top of the goal to put the Beavers out in front, 2-0, in the 26th minute. Bianco was then the recipient of a Kaileigh Nuessgen pass off a corner kick with just under 10 minutes left to play in the half. She headed Nuessgen’s kick in for Beavercreek’s third score of the half. “We practice those set plays all the time, and it was just an opportunity that we had to convert on. You never know when you’ll get another chance like that,” Bianco said. In the 39th minute, Cash dished off a pass to teammate Diana Benigno who beat Strongsville keeper Reanna Laurel to the ball then punched in a score into the left side of the Mustangs’ net for the final tally of the first half. Benigno couldn’t stop smiling after the match. The Mustangs upped their offensive intensity in the second half. Kayla Wypasek scored in the 63rd minute on a penalty kick, caused by a hand ball call in the box to make the score 4-1. Then, Madeline Blakley knocked in what appeared to be a wind-aided corner kick in the 74th minute for Strongsville’s second score. Strongsville (19-1-3) outshot Beavercreek by a 10-3 margin in the second half, and launched seven corner kick tries in the half, but the Beavers’ Lauren Galloway recorded six second-half saves to keep Beavercreek out front. COVER GUY — Graduated senior Dominic Calabrese can be found on the cover of the OHSAA’s official soccer program. the Beavercreek boys defeated Medina in an exciting double overtime thriller to win the Division I boys title last season. HOMETOWN SUPPORT — Beavercreek students, the school’s marching band, cheerleaders and fans almost completely filled four of the lower sections of MAPFRE Stadium for Friday night’s championship match. Strongville, from the Cleveland area, had a little farther to drive and filled just over two sections of its half of the stands.